Malaria is one of the most serious health problems in many parts of the world, particularly in Africa and Latin America with a high mortality rate. The situation is further complicated by the spread of drug-resistant parasites in many parts where plasmodium falciparum is endemic. A few alternative drugs are under development, necessitating urgent efforts to identify new classes of antimalarial agents. There is therefore a need to find new, effective and affordable remedies for malaria, including those derived from plants. The clinical utility of the Chinese discovery of artemisinin from the herb Artemisia annua has stimulated much interest in traditional plants as potential sources of new antimalarial drugs. In this study, the antimalarial activity of Artemisia diffusa extracts and the fraction which contains sesquiterpene lactones including Tehranolide, on Plasmodium berghei in vivo on the mice model of malaria was investigated. We did our best to carry out the biological tests as well as the phytochemical investigations from the same collection. It demonstrates that crude extracts of Artemisia diffusa inhibit the growth of Plasmodium berghei in vivo in NMRI mice. The microscopic examination of Giemsa stained slides showed a virtual absence of all blood-stage of murine malaria treated with three concentrations of herbal extracts including 27, 2.7 and 0.27 mg/ml. These observations suggest that the active constituents in the extract may be cytotoxic for P. berghei, thereby inhibiting their development to the erythrocytic stage. The results specifically indicated the inhibitory effects of the A.diffusa crude extracts and the fraction which contains sesquiterpene lactones including Tehranolide, on the developmental stages of P. berghei by decreasing parasitaemia. The present study reports the effects of S. alata (Ceasalpiniaceae) extract on the metabolism of polyamines resulting from the proliferation of leukaemia cells (L1210). The results established that the inhibition of cell proliferation was significantly increased with the concentration of extract from 28 to 32.80 % after 72 h. The percentage of cells viability changed significantly from 9.72 to 80 % when cells are treated with extract alone, in combination with DEMO or putrescine. The levels of the intracellular yield of putrescine, spermidine and spermine were also reduced by the extract compared to the control. The DEMO-extract complex enhanced the inhibition of the production polyamines up to 95 %. In opposite, the complex S. alata- putrescine complex stimulated significantly its biosynthesis of polyamines. A significant reduction of the level of protein after 72 h of treatment was observed. This result corroborated with the reduction of polyamines resulting from inhibition cell proliferation. Hairy root cultures were induced from leaf explants of Linum tauricum ssp. Tauricum by infection with Agrobacterium rhizogenes. Different bacterial strains of Agrobacterium rhizogenes - TR 105 and ATCC 15834 were evaluated for induction of transformed hairy roots in Linum tauricum ssp. Tauricum. These different strains varied in their virulence for induction of hairy roots in this species. Acetosyringon in cultivation medium was used to increase of frequency of hairy root induction. Growth kinetics of transgenic roots indicated a similar pattern of growth, with maximum growth occurring between 17 and 20 days. The transformed nature of tissue was confirmed by the production of opines. The lignin production of different clones was found to be growth-related. The cultures produced to 2.6% of the lignin 4'-demethyl-6-methoxypodophylotoxin (4'-DM-MPTOX) and to 3.5% of the lignin 6-methoxypodophyllotoxin (6MPTOX) on a dry weight basis, which was 10 to 12 times higher than in Linum tauricum ssp. Tauricum cell suspensions. Transformed cultures showed significant differences in lignin content. The highest amount of 4'-DM-MPTOX and MPTOX was found in transformed line induced by strain ATCC 15834. Rapidly growing root lines were selected to increase the efficiency of he production of lignans. Previous studies have shown that a decoction prepared from a mixture of Nigella sativa seeds, Hemidesmus indicus roots and Smilax glabra rhizome, has the potential to protect against diethylnitrosamine (DEN) induced hepatocarcinogenic changes in rats. 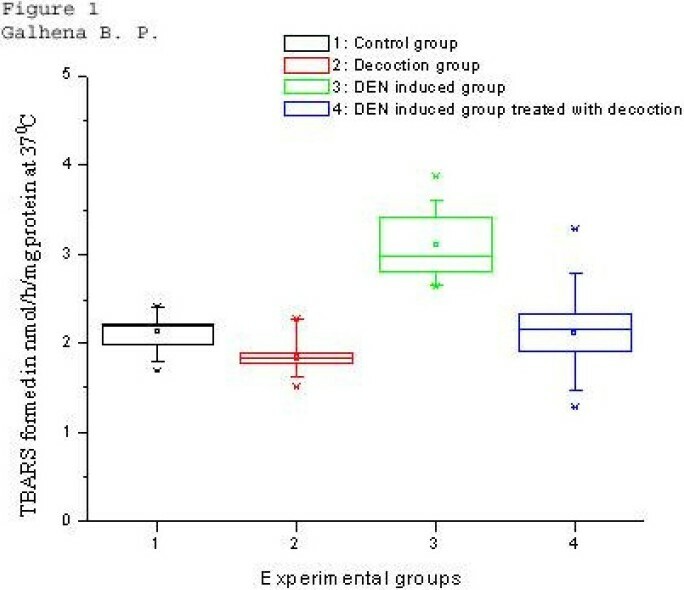 The present in-vivo investigation with Wistar rats was conducted to determine whether the treatment with above decoction (6 g / kg / day) for a period of 10 weeks can provide protection against DEN (200 mg / kg by a single i.p. 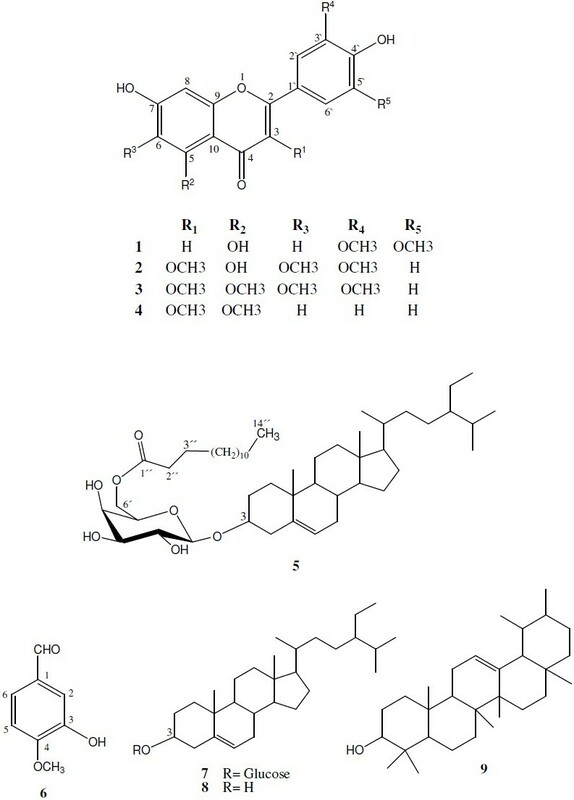 injection) mediated changes in (a) lipid peroxidation, (b) glutathione (GSH) concentration, (c) activities of the antioxidant enzymes superoxide dismutase (SOD) and glutathione peroxidase (GPx), and (d) activity of the phase II detoxification enzyme glutathione S-transferase (GST). DEN administration resulted in a significant (p<0.05) enhancement (+ 46.2%) of lipid peroxidation (as assessed by formation of thiobarbituric acid reactive substances, TBARS), accompanied by a decreased GSH concentration (- 21.7% in liver; - 5.9% in blood), and activities of SOD (- 34.3%), GPx (- 49.1%) and GST (- 19.38%). Administration of the decoction to DEN treated animals resulted in a significant (p<0.05) reduction in TBARS production, along with a restoration towards the normal levels, of the other biochemical parameters evaluated. The overall results obtained suggests that, protection against DEN - mediated changes in oxidative stress and enhancement of the activities of enzymes participating in carcinogen detoxification are possible mechanisms utilized by the decoction to mediate its anti-hepatocarcinogenic action. Phytochemical study of the aerial parts of Imperata cylindrica Beauv. (Graminae), growing in Egypt afforded four methoxylated flavonoids 1-4 , β-sitosterol-3-0-β-D-glucopyranosyl-6 ' -tetradecanoate 5 , 3-hydroxy-4-methoxy­benzaldehyde 6 , together with daucosterol, β-sitosterol and α-amyrin 7-9. To the best of our knowledge, this is the first isolation of compounds 1-5 from the genus Imperata. A significant hepato-protective activity had been observed upon co-administration of the methanolic extracts of I. cylindrica with CCl 4 . The structures were determined using spectroscopic data; 1D ( 1 H and 13 C), 2D (HSQC, and HMBC) NMR; MS; UV and IR. PHF, a polyherbal formulation, consist of seven known herbs namely, Aegle marmelos, Elettaria cardamomum, Glycyrrhiza glabra, Citrus aurantifolia, Rosa damascene, Cissus quadrangularis and Saccharum officinarum. The PHF was evaluated for acute toxicity, gastrointestinal motility and gastric emptying rate in mice and rats. Based on acute toxicity study, the PHF was considered as safe and 3 dose (100, 200 and 400 mg/kg) levels were employed for further pharmacological studies. 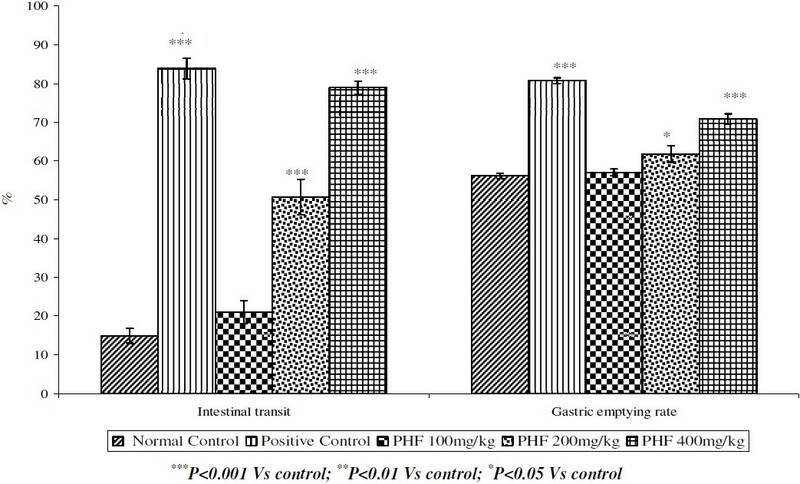 The gastrointestinal prokinetics effect of PHF in various dose levels (100, 200 and 400 mg/kg., p.o) was studied by charcoal meal gastrointestinal transit and laxative effect in mice. The gastric emptying rate of PHF in rat was studied by disappearance of phenol red from stomach. The results illustrate that PHF at 200 and 400 mg/kg significantly (p<0.001) enhanced the gastrointestinal transit. PHF at 400 mg/kg (p<0.01) significantly enhanced the purging index, which is the measure of laxative activity. PHF at 200 mg/kg (p<0.05) less significantly enhanced the purging index. In gastric emptying rate, PHF dose dependently increased the gastric emptying. From the above findings, PHF may be used as gastrointestinal prokinetics and to improve the intestinal motility. 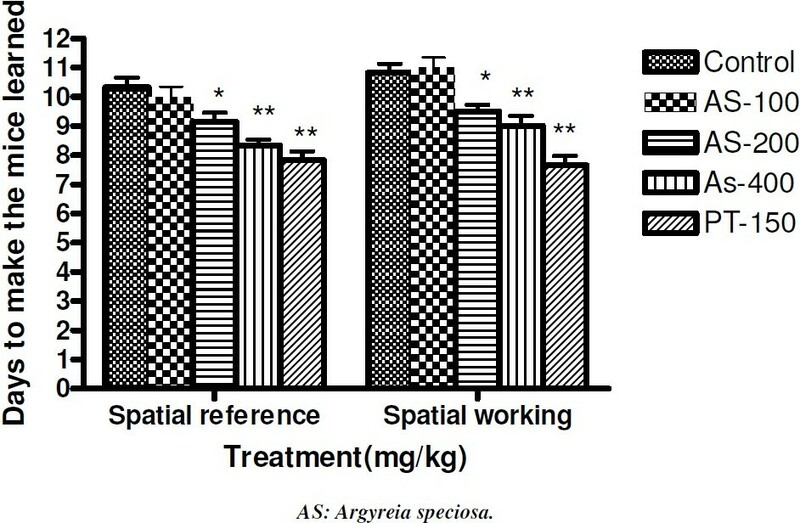 The objective of the present study was to investigate the effect of hydroalcoholic extract of Argyreia speciosa (AS) on learning and memory paradigms in mice. Radial arm maze and morris water maze were the screening tests used to assess the activity of the extract. Piracetam served as a reference standard. The mice pretreated with AS 200 or AS 400 mg/kg or Piracetam (150mg/kg) showed a decrease in number of days required to make the mice learned, time taken to find food by the learned mice in radial arm maze. In morris water maze, the mice treated with the above mentioned doses showed a significant reduction in the number of days required to make the mice learned, escape latency of learned mice and number of circles completed before it escapes on to the platform. The results suggest facilitation of spatial learning and memory processes and thereby validated its traditional claim of being tonic in dullness of intellect. Various parts of Newbouldia laevis (fam. Bignoniaceae) are used for pain and several inflammatory conditions in Ghana. 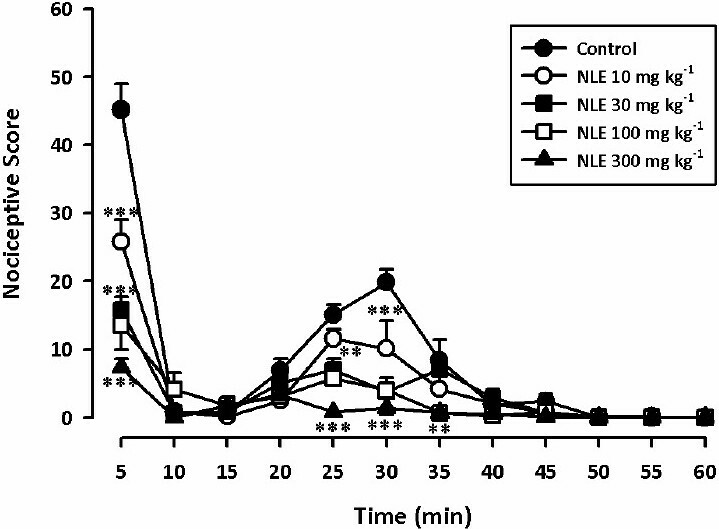 This study presents the effect of a hydro-alcoholic extract of N. leavis stem bark in formalin-induced pain, a model of neuropathic pain, in rats. Morphine (1-10 mg kg -1 i.p) and stem bark extract of N. laevis (10-300 mg kg -1 p.o. ),dose-dependently decreased both phases of the formalin-induced nociceptive behaviour. 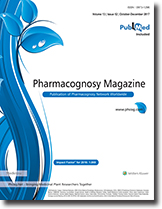 Nocifensive response for morphine was four fold higher in the first phase (ED 50; 7.59 ± 0.63 mg kg -1 ) compared to the second (ED 50 ;7.59± 2.26) ; however the response for the extract was similar in both phases (ED 50; first phase 28.28±7.02; ED 50; second phase 25.07 ± 5.83). Diclofenac (10-100 mg kg -1 ) was effective only in the second phase (ED 50 33.24± 5.20). The potency of the drugs was in the order; morphine > extract > diclofenac for the first phase and morphine > extract = diclofenac for the second phase. The results from this study show that N. laevis extract has central and peripheral analgesic properties and thus adds credence to its traditional uses. Herb-drug interaction studies have getting attention recently due to the increasingly use of herbal products worldwide. The porpose of the present study was to examine the in vitro effect of methanol leaf extract of Orthosiphon stamineus and Morinda citrofolia fruit juice extract on hepatic aminopyrine metabolism by CYP 3A in different age of normal and STZ-induced diabetic Sprague Dawley (SD) rats. Isolated rat hepatocytes were prepared using the collagenase perfusion technique. Aminopyrine was used as a probe substrate to determine the hepatic levels of CYP 3A by measuring the activity of N-demethylation of aminopyrine in rat hepatocytes according to the method described by Nash. Results obtained showed that aminopyrine N-demethylase activity measured from all diabetic rat hepatocytes was not affected by 0. stamineus and M. citrifolia extract. A significant decrease in the aminopyrine N-demethylase activity was observed in the normal old male SD rat hepatocytes preincubated with 0.1 mg/kg (P<0.01) of methanol extract of 0. stamineus when compared to the respective control group. M. citrifolia juice extract at 0.1 mg/ml (P<0.01) significantly increased aminopyrine N-demethylase activity in normal adult male SD rat hepatocytes as compared to the control group. For conclusion, both M. citrifolia and 0. stamineus extract could affect the in vitro metabolism of aminopyrine by CYP3A in normal rat hepatocytes. 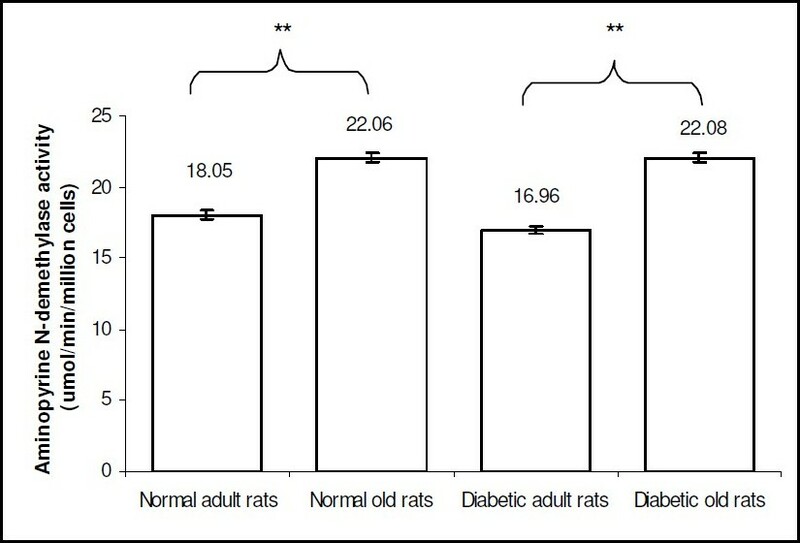 No significant change in the hepatic aminopyrine metabolism was observed in the diabetic rats after incubating with different concentrations of M. citrifolia and 0. stamineus extracts. The observed herb-drug interactions in the present study was age- and disease-dependent. 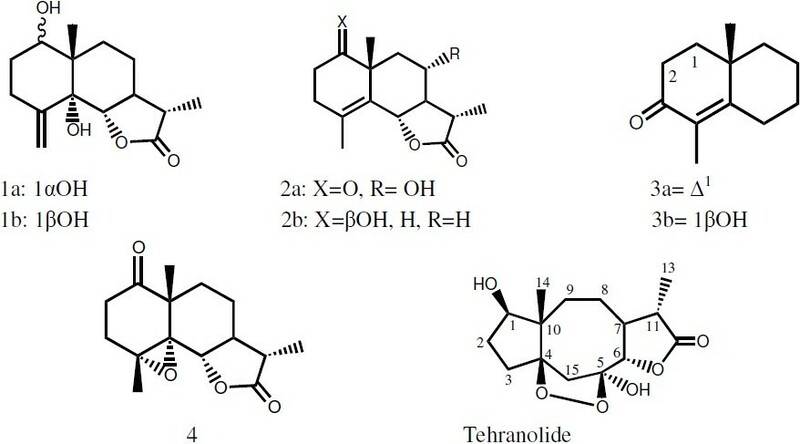 Chemical examination of the needles and young stems of Taxus baccata L. from Iran, resulted in the isolation of three taxane diterpenoids , two previously reported taxoids, taxupinanane L and taxupinanane G, and a new taxoid, 2,9-deacetyltaxinine J. The structures of these compounds were determined on the basis of spectroscopic data. These three taxoids were not previously encountered in Taxus baccata L. species. A simple, precise, rapid and accurate, binary reverse phase high performance liquid chromatographic method has been developed for the determination of curcumin a natural drugs with short run time. 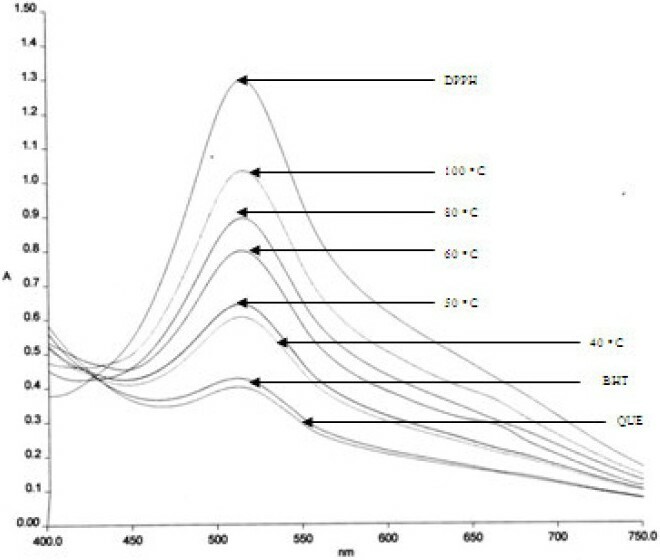 Chromatographic separation was achieved by using Merck C15 (250 cm X 4.6 mm) Column with mobile phase acetonitril: tetrahydrofuran: 2% acetic acid 50:30:20 (2%) was used. The flow rate was 0.7 ml/min. The retention time was 4.587 minutes. The limit of detection and limit of quantification of curcumin were between 3.68 to 8.125 ng/ml for 50-μL injection volumes. The percentage recovery of curcumin was found to be 97.2 to 98.4 and Relative standard deviation was 0.345 % and 1.160 %. The developed HPLC method can therefore be applied to both in vitro studies of curcumin formulations as well as drug estimation in biological samples. In Brazil, a popular preparation of Ampelozizyphus amazonicus Ducke is widely used to prevent malaria. Physical chemistry analyses such as atomic absorption spectrophotometer, HPLC and antioxidant activity by spectrophotometer were used to evaluate the raw botanic material (stem barks, leaves, twigs and root barks) and extracts of root barks. 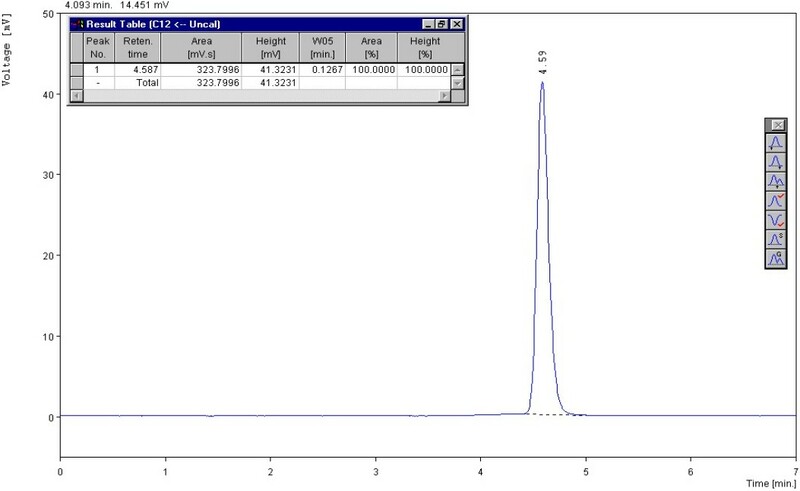 The chromatographic profile of the 1% root barks preparation of A. amazonicus showed 48.4% of saponins that are important point for the knowledge of this popular formulation. The concentration levels of macronutrients and micronutrients along with phosphorus were obtained from this species. The iron level of the root barks was higher than that observed in the other vegetal material. This result was considered relevant based on the fact that certain malaria-related processes involve the presence of iron and the root barks are the part of the plant used by the population. The DDPH assays showed that the one-percent extracts have no relevant ability as free-radical scavengers or hydrogen donors but these results may be associated to the parasite evolutive cycle and the popular use of the plant for the prophylaxis of malaria. The root barks preparation like the folk use did not present significant toxicity to brine shrimp. The effect of extraction temperature on total phenolic contents and free radical scavenging activity of Gynura procumbens leaf extract was investigated. The content of total phenolic were not significantly different (P > 0.5) at the extraction temperature of 40 °C and 50 °C. However, decrease in total phenolic content was observed from extraction temperature of 60 °C and above. The extracts obtained at lower temperature exhibited significant free radical-scavenging activity compared to extraction at higher temperatures. Adhatoda schimperiana has been used in Ethiopian traditional medicine as a remedy for bronchial asthma. 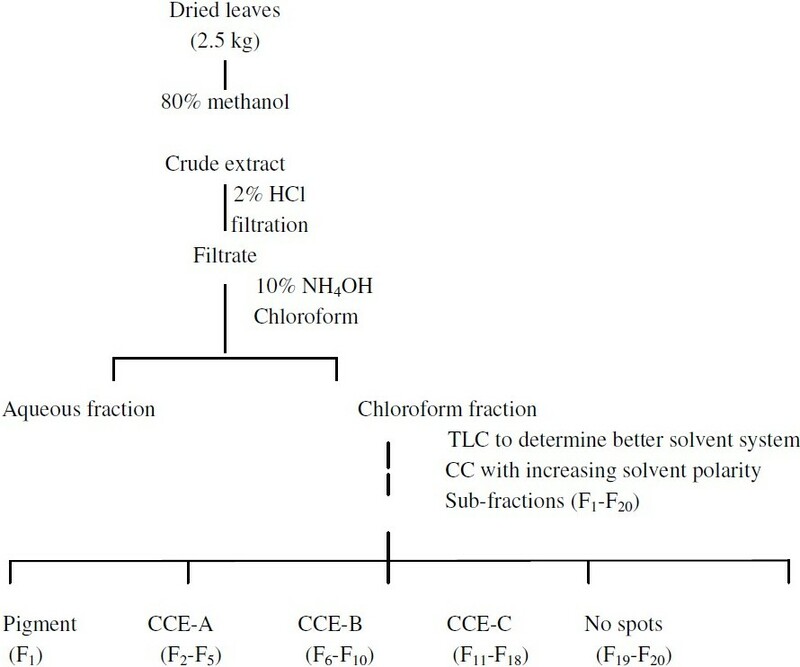 In the present study, tracheal relaxant effect of column chromatographic elutes (CCEs) of the chloroform fraction of the leaves of the plant was investigated on guinea-pigs. The intermediate polar CCE of the chloroform fraction showed tracheal relaxant effect as observed by a right-ward shift of the dose-response curve. The maximum response to histamine in presence of the intermediate polar CCE was significantly lower than that of the chloroform fraction (p<0.05). These results suggest that bioactivity-guided fractionation could show improved tracheal relaxant activity, and the alkaloid-rich fraction of the crude extract might be responsible for the claimed anti-asthmatic effect of the plant.